ADvance was a randomized trial of patients aged 45-85 with mild Alzheimer’s disease. The trial compared the effects of DBS turned on to those observed with the system turned off. The patients underwent regular physiological, psychological and cognitive assessments for 12 months at which time those patients in the off group were eligible to have the system activated. Brain imaging measures of changes in glucose metabolism and the size of key structures involved in memory were assessed at multiple time points. 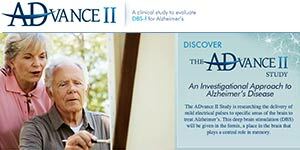 ADvance was conducted at seven leading research centers in North America: Banner Alzheimer's Institute in Phoenix, Ariz.; Banner Sun Health Research Institute in Sun City, Ariz.; Butler Hospital and Rhode Island Hospital in Providence, R.I.; Johns Hopkins Bayview Medical Center in Baltimore, Md. ; Toronto Western Hospital in Toronto, Ont. ; University of Florida Center for Movement Disorders and Neurorestoration in Gainesville, Fla; and the University of Pennsylvania in Philadelphia, Pa.
ADvance was co-chaired by Andres Lozano, MD, PhD, R.R. Tasker Chair in Stereotactic and Functional Neurosurgery at the University Health Network and University of Toronto and Scientific Founder of the company; and Constantine Lyketsos, MD, MHS, Elizabeth Plank Althouse Professor, Johns Hopkins University, and Director, Johns Hopkins Memory and Alzheimer's Treatment Center.